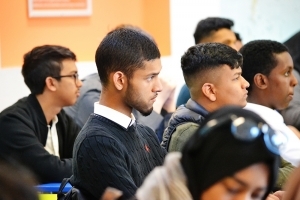 On Wednesday 14th November, Ernst & Young, the prestigious multinational professional services firm, met with Year 12 students in the Sixth Form Centre. Our Sixth Form students are very fortunate to be given the privilege to be part of an innovative pilot scheme with the organisation. 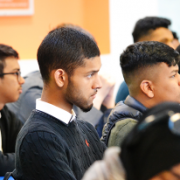 The academy is one of four schools selected in London piloting a two week term-time, London Smart Futures programme in June 2019 with up to 30 Year 12 students. The enterprising group of professionals, delivered a presentation to students detailing the application process and they shared tips about telephone interview process. We continuously strive to ensure our students are presented with unique opportunities such as this, which sets them apart from their peers. 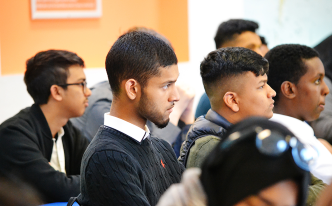 Our offer at Sixth Form is dedicated to preparing students for life in modern Britain and we constantly provide our students with a wealth of support and enrichment opportunities, to complement the curriculum and develop ambition, curiosity and drive.